What should I know about brain tumor (facts*)? What is the treatment for a brain tumor? What about a second opinion for brain tumor treatment? What type of surgery is available for brain tumors? What supportive care is available for patients and caregivers? What about rehabilitation after brain tumor treatment? What about follow-up care after brain tumor treatment? *Brain tumor facts medically edited by: breathing (brain stem), activity like moving muscles to walk (cerebellum) and your senses like sight and our memory, emotions, thinking and personality (cerebrum). Researchers and doctors do not know exact cause of brain tumors. Risk factors include exposure to ionizing radiation and family history of brain tumors. The signs symptoms of brain tumors depend on their size, type, and location. The most common signs symptoms include headaches; numbness or tingling in the arms or legs; seizures; memory problems; mood and personality changes; balance and walking problems; nausea and vomiting; or changes in speech, vision, or hearing. Doctors group brain tumors are classified by grade (grade I, grade II, grade III, or grade IV -the most severe). The grade is determined by the way the cells look under a microscope. The higher the grade number, the more abnormal the cells appear, and the more aggressively the tumor usually behaves. The most common types of primary brain tumors among adults are astrocytoma, meningiom (a tumor that arises from the membranes surrounding the brain and spinal cord) and oligodendroglioma. The most common type of primary brain tumors in children are medulloblastoma, grade I or II astrocytoma, (or glioma) ependymoma, and brain stem glioma. Studies have found risk factors for brain tumors to include ionizing radiation from high dose X-rays (for example, radiation therapy where the machine is aimed at the head), and family history. Diagnosis of a brain tumor is done by a neurologic exam (by a neurologist or neurosurgeon), CT (computer tomography scan) and/or magnetic resonance imaging (MRI), and other tests like an angiogram, spinal tap and biopsy. Your diagnosis helps predict the treatment. Neurologists base the treatment of brain tumors on the type, location, and size of the tumor, your health, and age. Treatment options may include surgery, radiation therapy, or chemotherapy (or a combination of treatments). Supportive care is important before, during and after treatment to minimize symptoms and to improve your quality of life. Some patients can qualify for clinical trials. Contact information is provided at the end of this article. Reference: Lo, BM. "Brain Neoplasms." Medscape. Updated Nov 09, 2015. This picture shows the brain and nearby structures. 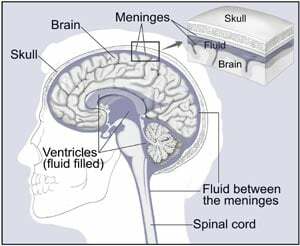 Watery fluid (cerebrospinal fluid) that flows through spaces between the meninges and through spaces (ventricles) within the brain. A network of nerves carries messages back and forth between the brain and the rest of the body. Some nerves go directly from the brain to the eyes, ears, and other parts of the head. Other nerves run through the spinal cord to connect the brain with the other parts of the body. Within the brain and spinal cord, glial cells surround nerve cells and hold them in place. This picture shows the major parts of the brain. Cerebrum: The cerebrum uses information from our senses to tell us what is going on around us and tells our body how to respond. It controls reading, thinking, learning, speech, and emotions. The cerebrum is divided into the left and right cerebral hemispheres. The right hemisphere controls the muscles on the left side of the body. The left hemisphere controls the muscles on the right side of the body. Cerebellum: The cerebellum controls balance for walking and standing, and other complex actions. 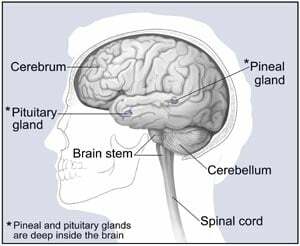 Brain stem: The brain stem connects the brain with the spinal cord. It controls breathing, body temperature, blood pressure, and other basic body functions. When most normal cells grow old or get damaged, they die, and new cells take their place. Sometimes, this process goes wrong. New cells form when the body doesn't need them, and old or damaged cells don't die as they should. The buildup of extra cells often forms a mass of tissue called a growth or tumor. Benign brain tumors usually have an obvious border or edge. Cells from benign tumors rarely invade tissues around them. They don't spread to other parts of the body. However, benign tumors can press on sensitive areas of the brain and cause serious health problems. Benign brain tumors may become malignant. Malignant brain tumors are generally more serious and often are a threat to life. Cancer cells may break away from malignant brain tumors and spread to other parts of the brain or to the spinal cord. They rarely spread to other parts of the body. Astrocytoma: The tumor arises from star-shaped glial cells called astrocytes. It can be any grade. In adults, an astrocytoma most often arises in the cerebrum. Grade I or II astrocytoma: It may be called a low-grade glioma. Grade III astrocytoma: It's sometimes called a high-grade or an anaplastic astrocytoma. Grade IV astrocytoma: It may be called a glioblastoma or malignant astrocytic glioma. Grade I or II astrocytoma: In children, this lowgrade tumor occurs anywhere in the brain. The most common astrocytoma among children is juvenile pilocytic astrocytoma. It's grade I.
Ependymoma: The tumor arises from cells that line the ventricles or the central canal of the spinal cord. It's most commonly found in children and young adults. It can be grade I, II, or III. Over time, a low-grade tumor may become a high-grade tumor. However, the change to a high-grade tumor happens more often among adults than children. Biopsy at the same time as treatment: The surgeon takes a tissue sample when you have surgery to remove part or all of the tumor. See the Surgery section. Stereotactic biopsy: You may get local or general anesthesia and wear a rigid head frame for this procedure. The surgeon makes a small incision in the scalp and drills a small hole (a burr hole) into the skull. CT or MRI is used to guide the needle through the burr hole to the location of the tumor. The surgeon withdraws a sample of tissue with the needle. A needle biopsy may be used when a tumor is deep inside the brain or in a part of the brain that can't be operated on. Why do I need a biopsy? How will the biopsy results affect my treatment plan? What are the chances of infection or bleeding after the biopsy? Are there any other risks? If I do have a brain tumor, who will talk with me about treatment? When? Can you recommend other doctors who could give me a second opinion about my treatment options? How often should I have checkups? Before starting treatment, you might want a second opinion about your diagnosis and treatment plan. Some people worry that the doctor will be offended if they ask for a second opinion. Usually the opposite is true. Most doctors welcome a second opinion. And many health insurance companies will pay for a second opinion if you or your doctor requests it. Some companies require a second opinion. If you get a second opinion, the doctor may agree with your first doctor's diagnosis and treatment plan. Or the second doctor may suggest another approach. Either way, you'll have more information and perhaps a greater sense of control. You can feel more confident about the decisions you make, knowing that you've looked at your options. It may take some time and effort to gather your medical records and see another doctor. In many cases, it's not a problem to take several weeks to get a second opinion. The delay in starting treatment usually won't make treatment less effective. To make sure, you should discuss this delay with your doctor. Some people with a brain tumor need treatment right away. Also, you can request a consultation with specialists at the National Institutes of Health Clinical Center in Bethesda, Maryland. Adults and children with a brain tumor: Specialists in the NCI Neuro-Oncology Branch provide consultations. The telephone number is 301-594-6767 or 866-251-9686. Children with a brain tumor: Specialists in the NCI Pediatric Neuro-Oncology Section of the Pediatric Oncology Branch provide consultations. The telephone number is 301-496-8009 or 877-624-4878. Surgery is the usual first treatment for most brain tumors. Before surgery begins, you may be given general anesthesia, and your scalp is shaved. You probably won't need your entire head shaved. Surgery to open the skull is called a craniotomy. The surgeon makes an incision in your scalp and uses a special type of saw to remove a piece of bone from the skull. You may be awake when the surgeon removes part or all of the brain tumor. The surgeon removes as much tumor as possible. You may be asked to move a leg, count, say the alphabet, or tell a story. Your ability to follow these commands helps the surgeon protect important parts of the brain. After the tumor is removed, the surgeon covers the opening in the skull with the piece of bone or with a piece of metal or fabric. The surgeon then closes the incision in the scalp. Sometimes surgery isn't possible. If the tumor is in the brain stem or certain other areas, the surgeon may not be able to remove the tumor without harming normal brain tissue. People who can't have surgery may receive radiation therapy or other treatment. You may have a headache or be uncomfortable for the first few days after surgery. However, medicine can usually control pain. Before surgery, you should discuss the plan for pain relief with your health care team. After surgery, your team can adjust the plan if you need more relief. You may also feel tired or weak. The time it takes to heal after surgery is different for everyone. You will probably spend a few days in the hospital. Other, less common problems may occur after surgery for a brain tumor. The brain may swell or fluid may build up within the skull. The health care team will monitor you for signs of swelling or fluid buildup. You may receive steroids to help relieve swelling. A second surgery may be needed to drain the fluid. The surgeon may place a long, thin tube (shunt) in a ventricle of the brain. (For some people, the shunt is placed before performing surgery on the brain tumor.) The tube is threaded under the skin to another part of the body, usually the abdomen. Excess fluid is carried from the brain and drained into the abdomen. Sometimes the fluid is drained into the heart instead. Infection is another problem that may develop after surgery. If this happens, the health care team will give you an antibiotic. Brain surgery may harm normal tissue. Brain damage can be a serious problem. It can cause problems with thinking, seeing, or speaking. It can also cause personality changes or seizures. Most of these problems lessen or disappear with time. But sometimes damage to the brain is permanent. You may need physical therapy, speech therapy, or occupational therapy. See the Rehabilitation section. Do you suggest surgery for me? What will you do for me if I have pain? Will I have any long-term effects? Will my hair grow back? Are there any side effects from using metal or fabric to replace the bone in the skull? Radiation therapy kills brain tumor cells with high-energy x-rays, gamma rays, or protons. Radiation therapy usually follows surgery. The radiation kills tumor cells that may remain in the area. Sometimes, people who can't have surgery have radiation therapy instead. External radiation therapy: You'll go to a hospital or clinic for treatment. A large machine outside the body is aimed to direct beams of radiation at either the whole brain or more commonly, at specific portions of the brain. Some people need radiation aimed at the spinal cord also. The treatment schedule depends on your age, and the type and size of the tumor. Fractionated external beam therapy, in which small doses or fractions of radiation are given usually once each day, is the most common method of radiation therapy used for people with brain tumors. Giving the total dose of radiation over several weeks helps to protect healthy tissue in the area of the tumor. Treatments are usually 5 days a week for several weeks. A typical visit lasts less than an hour, and each treatment takes only a few minutes. Intensity-modulated radiation therapy or 3-dimensional conformal radiation therapy: These types of treatment use computers to more closely target the brain tumor to lessen the damage to healthy tissue. Proton beam radiation therapy: The source of radiation is protons rather than X-rays. The doctor aims the proton beam at the tumor. The dose of radiation to normal tissue from a proton beam is less than the dose from an X-ray beam. Stereotactic radiation therapy: Narrow beams of X-rays or gamma rays are directed at the tumor from different angles. For this procedure, you wear a rigid head frame. The therapy may be given during a single visit (stereotactic radiosurgery) or over several visits. Internal radiation therapy (implant radiation therapy or brachytherapy): Internal radiation isn't commonly used for treating brain tumors and is under study. The radiation comes from radioactive material usually contained in very small implants called seeds. The seeds are placed inside the brain and give off radiation for months. They don't need to be removed once the radiation is gone. Some people have no or few side effects after treatment. Rarely, people may have nausea for several hours after external radiation therapy. The health care team can suggest ways to help you cope with this problem. Radiation therapy also may cause you to become very tired with each radiation treatment. Resting is important, but doctors usually advise people to try to stay as active as they can. Also, external radiation therapy commonly causes hair loss from the part of the head that was treated. Hair usually grows back within a few months. Radiation therapy also may make the skin on the scalp and ears red, dry, and tender. The health care team can suggest ways to relieve these problems. Sometimes radiation therapy causes brain tissue to swell. You may get a headache or feel pressure. The health care team watches for signs of this problem. They can provide medicine to reduce the discomfort. Radiation sometimes kills healthy brain tissue. Although rare, this side effect can cause headaches, seizures, or even death. Radiation may harm the pituitary gland and other areas of the brain. For children, this damage could cause learning problems or slow down growth and development. In addition, radiation increases the risk of secondary tumors later in life. By mouth or vein (intravenous): Chemotherapy may be given during and after radiation therapy. The drugs enter the bloodstream and travel throughout the body. They may be given in an outpatient part of the hospital, at the doctor's office, or at home. Rarely, you may need to stay in the hospital. The side effects of chemotherapy depend mainly on which drugs are given and how much. Common side effects include nausea and vomiting, loss of appetite, headache, fever and chills, and weakness. If the drugs lower the levels of healthy blood cells, you're more likely to get infections, bruise or bleed easily, and feel very weak and tired. Your health care team will check for low levels of blood cells. Some side effects may be relieved with medicine. In wafers that are put into the brain: For some adults with high-grade glioma, the surgeon implants several wafers into the brain. Each wafer is about the size of a dime. Over several weeks, the wafers dissolve, releasing the drug into the brain. The drug kills cancer cells. It may help prevent the tumor from returning in the brain after surgery to remove the tumor. People who receive an implant (a wafer) that contains a drug are monitored by the health care team for signs of infection after surgery. An infection can be treated with an antibiotic. Will I have side effects? What can I do about them? It's important for you to take care of yourself by eating well. You need the right amount of calories to maintain a good weight. You also need enough protein to keep up your strength. Eating well may help you feel better and have more energy. Sometimes, especially during or soon after treatment, you may not feel like eating. You may be uncomfortable or tired. You may find that foods don't taste as good as they used to. In addition, the side effects of treatment (such as poor appetite, nausea, vomiting, or mouth blisters) can make it hard to eat well. Your doctor, a registered dietitian, or another health care provider can suggest ways to deal with these problems. A brain tumor and its treatment can lead to other health problems. You may receive supportive care to prevent or control these problems. You can have supportive care before, during, and after cancer treatment. It can improve your comfort and quality of life during treatment. Swelling of the brain: Many people with brain tumors need steroids to help relieve swelling of the brain. Seizures: Brain tumors can cause seizures (convulsions). Certain drugs can help prevent or control seizures. Fluid buildup in the skull: If fluid builds up in the skull, the surgeon may place a shunt to drain the fluid. Information about shunts is in the Surgery part of the Treatment section. Sadness and other feelings: It's normal to feel sad, anxious, or confused after a diagnosis of a serious illness. Some people find it helpful to talk about their feelings. See the Sources of Support section for more information. Many people with brain tumors receive supportive care along with treatments intended to slow the progress of the disease. Some decide not to have antitumor treatment and receive only supportive care to manage their symptoms. Rehabilitation can be a very important part of the treatment plan. The goals of rehabilitation depend on your needs and how the tumor has affected your ability to carry out daily activities. Some people may never regain all the abilities they had before the brain tumor and its treatment. But your health care team makes every effort to help you return to normal activities as soon as possible. Physical therapists: Brain tumors and their treatment may cause paralysis. They may also cause weakness and problems with balance. Physical therapists help people regain strength and balance. Speech therapists: Speech therapists help people who have trouble speaking, expressing thoughts, or swallowing. Occupational therapists: Occupational therapists help people learn to manage activities of daily living, such as eating, using the toilet, bathing, and dressing. Physical medicine specialists: Medical doctors with special training help people with brain tumors stay as active as possible. They can help people recover lost abilities and return to daily activities. Children with brain tumors may have special needs. Sometimes children have tutors in the hospital or at home. Children who have problems learning or remembering what they learn may need tutors or special classes when they return to school. You'll need regular checkups after treatment for a brain tumor. For example, for certain types of brain tumors, checkups may be every 3 months. Checkups help ensure that any changes in your health are noted and treated if needed. If you have any health problems between checkups, you should contact your doctor. Your doctor will check for return of the tumor. Also, checkups help detect health problems that can result from cancer treatment. Checkups may include careful physical and neurologic exams, as well as MRI or CT scans. If you have a shunt, your doctor checks to see that it's working well. The NCI has publications to help answer questions about follow-up care and other concerns. You may find it helpful to read the NCI article Facing Forward: Life After Cancer Treatment. You may also want to read the NCI article Follow-up Care After Cancer Treatment. Learning you have a brain tumor can change your life and the lives of those close to you. These changes can be hard to handle. It's normal for you, your family, and your friends to need help coping with the feelings that such a diagnosis can bring. Doctors, nurses, and other members of your health care team can answer questions about treatment, working, or other activities. Support groups also can help. In these groups, people with brain tumors or their family members meet with other patients or their families to share what they have learned about coping with the disease and the effects of treatment. Groups may offer support in person, over the telephone, or on the Internet. You may want to talk with a member of your health care team about finding a support group. Information specialists at 1-800-4-CANCER (1-800-422-6237) and at LiveHelp (http://www.cancer.gov/livehelp) can help you locate programs, services, and publications. They can send you a list of organizations that offer services to people with cancer. For tips on coping, you may want to read the NCI booklet Taking Time: Support for People With Cancer. Cancer research has led to real progress in the detection and treatment of brain tumors. Continuing research offers hope that in the future even more people with brain tumors will be treated successfully. Doctors all over the country are conducting many types of clinical trials (research studies in which people volunteer to take part). Clinical trials are designed to find out whether new approaches are safe and effective. Doctors are trying to find better ways to care for adults and children with brain tumors. They are testing new drugs and combining drugs with radiation therapy. They are also studying how drugs may reduce the side effects of treatment. Even if the people in a trial do not benefit directly, they may still make an important contribution by helping doctors learn more about brain tumors and how to control them. Although clinical trials may pose some risks, doctors do all they can to protect their patients. If you're interested in being part of a clinical trial, talk with your doctor. You may want to read the NCI booklet Taking Part in Cancer Treatment Research Studies. It describes how treatment studies are carried out and explains their possible benefits and risks. The NCI Web site includes a section on clinical trials at http://www.cancer.gov/clinicaltrials. It has general information about clinical trials as well as detailed information about specific ongoing studies of brain tumors. NCI's Information Specialists at 1-800-4-CANCER (1-800-422-6237) and at LiveHelp (http://www.cancer.gov/livehelp) can answer questions and provide information about clinical trials. SOURCE: United States. National Cancer Institute. "Brain Tumors." Feb. 2009. <http://www.cancer.gov/publications/patient-education/brain.pdf>.